Samara, the cool and efficient office assistant at work, is hopelessly attracted to her boss. Strong as the attraction is, she’s equally determined to keep it a secret from the suave tycoon, Tahir Virani. Tahir, the distant and at times, sarcastic boss, has no time for Samara. Embittered and cynical after his failed marriage, he has no intention of getting involved and certainly not in anything long term. A kiss changes everything. The office logistics go haywire as awareness zooms to level ‘O’. Soon, one thing is clear, they can no longer ignore each other. But Tahir has clearly no intention of breaking his office protocol and Samara would never settle for a fling. When the fire is set, who can avoid the blaze? Hot passionate romance!! The story of totally unmatched people, who come come to realise that they are the only one's made for each other! Summerita Rhayne has created a superb character in handsome Tahir, who also shows glimpses of both high professional ethics and ingrained traditional values. He is intense, bitter and hot. Practical, down to earth Samara, madly in love with him, is shackled by the office moral code, which are sacrosanct to him. Attraction and emotional needs brings Tahir close to her but the rules of the game are unacceptable to her. Then there was Tahir’s jealous, glamorous ex-wife. The palpable attraction between the two and the fight of principles takes us on an intense, hot and passionate journey. 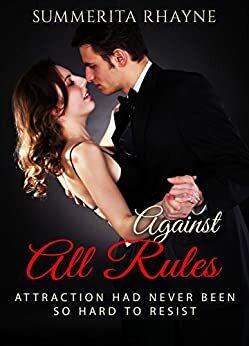 If one is looking for a hotter than hot Indian romance on a dreamy night or day ‘Against All Rules’ is the book. 3.0 out of 5 starsLovely story; executed well. Good debut! Against All Rules by Summerita Rhayne is a passionate, intense love story of Tahir & Samara - 2 individuals who come from very diverse social and cultural backgrounds, and who want very different things from a relationship. While Tahir is looking for a no-strings-attached affair, Samara has her heart set on the happily-ever-after. But the one thing that they both cannot deny/resist, is the palpable attraction between them. What follows next, is a tug of war between their desire for each other, and the need for control. Now, as I starting reading this, I got the feeling that this was following the tried and tested troupe of romance novels - an office romance, where the secretary is secretly in love with the boss. While that is the basic premise of this book, it is a lot more than just that. The plot has realistic conflicts, and relatable resolutions, and a strong backstory. Also, AAR is not the usual sappy love story; it is more of a sensual romance. Now, I don’t read that many sensual romances, and therefore cannot generalize, but since I slotted it as that, I was not expecting to find the kind of emotional depth that this story has. It is equal parts sensual, and emotional, which is a wonderful combination. Some parts (especially in the first half) were very repetitive. They could have been trimmed. Also, there is another area that required attention - logical breaks/pauses in story. Typically these breaks and pauses are indicated by starting new chapters, or more commonly, by bigger paragraph spaces or markers like these-> ‘----’. In many places there were no breaks indicated. The time and place changed, but the author just continued without any indicating any breaks . This might not bother some people, but it hampers the reading experience for me. Lastly, the cover - I couldn’t reconcile my mental image of Tahir & Samara to the people on the cover. This is really a personal choice, but I prefer sketches than photographs on the cover - which lets the reader imagine the faces. Overall: Lovely story; executed well. Tighter editing would have made this a far more satisfying read. Disclaimer: I downloaded a free copy on my Kindle during an Amazon promotion for the book. 4.0 out of 5 starsHOT ! Summerita Rhayne makes her debut with a hot, sizzling take on love, passion and desire. This scorching (you-can-see-the-fumes kind) is a story of a small-town-working-in-the-big-city kind of girl Samara. (Pretty name!). She has some hidden desire for her boss- Tahir. -- Till a kiss changes it all. Tahir feels a strong attraction towards her. She too is not immune to his desires. What starts after that is a cat and a mouse game between desire and control. Both are haunted by their past and both love their independence (thank god she is not the weeping willow kind). But passion is a decisive factor which burns them, till they are forced to give in to their basic instincts. :P Where will their passion lead them to? One is commitment phobia and the other wants to marry for love. Is there any solution for this? Summerita Rhayne is a great story teller. She has written the novel in a very sweet and sensuous way .The characters like Tahir and Samara are careful designed in way that it will make you one with those characters. Emotions are described in such a way that makes you feel the pain ,anguish, frustration and excitement which the characters go through .The dialogues are crisp. What I like about book is that Summerita has used new kind of setting in this novel. A very well written office romance .A loveable read . Highly recommended to all the romance lovers. Samara and Tahir have great chemistry, something I didn't expect from a romance set in India. It was well-executed and well-paced, expect for the little sag in the middle. A couple of time I did have a problem with how Tahir dominates Samara but, luckily, it wasn't too much. Well worth the read! 1.0 out of 5 starsDid not like it. well, it is a novela-rosa. Long, nothing really happens..